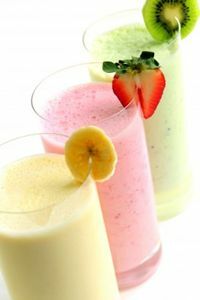 Here are a few tips that will help you to make your fruit smoothies look as great as they taste. 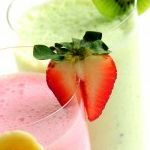 Delicious fruit smoothies are nutritious and healthy for all the family and you can really dress them up and lift them above an everyday drink by adding some finishing touches for serving. Ice cubes add refreshment to any drink on a hot day but they can also add extra taste and a pretty finishing touch. a. Try making your ice cubes from contrasting coloured fruit juices for an interesting effect. b. 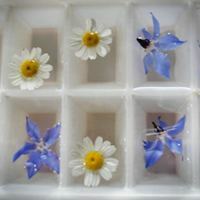 Make ice cubes with flowers inside them. Lots of culinary plants have flowers that are also good to eat. My own favourite is borage flowers which are such a pretty blue. c. Add smaller berries to individual ice cubes, for example wild strawberries, blueberries, blackberries and raspberries all make great additions. Just pop a single fruit into each ice cube compartment and add water. Tip: When making clear ice cubes or cubes with flowers or fruit inside, use cooled boiled water for clearer ice cubes! a. Glass rims look great with a sugar rim which is easy to do. Just slightly moisten the rim of each glass by dipping in a saucer of water, blotting slightly on a sheet of kitchen paper and then dipping into icing sugar. If you want more of a zing to your sugar frosting, use lemon or lime juice instead of water to moisten the rim of the glass before dipping it in the sugar. I like to make things even more interesting by adding very finely grated orange or lemon zest into caster sugar and then whizzing this in a food processor for a few seconds until all combined. b. Decorate your glasses with individual fruits such as strawberries deeply cut so that they sit on the rim of the glass. c. Make little fruit skewers to sit across the top of your glasses by skewering small fruits onto a wooden cocktail stick (toothpick). If you choose sharper fruits, these also look great dusted with caster or icing sugar just before serving. d. Suspend a sprig of redcurrants from your cocktail stick, they look great suspended over your drink. e. Make edible swizzle sticks. Experiment! I like to use celery sticks and if you slice one end of the stick very finely to about one inch from the end and then dip the cut end into iced water for about fifteen minutes before needed, the cuts will fan out (to make almost a brush) which looks very decorative. I hope my tips for decorating your fruit smoothies to make them look even more delicious and irresistible have fired your imagination. If you have a favourite tip for decoration, please leave a comment below – we would love to hear from you.